Wednesday March 5, 2014, 7:50 p.m.
A recall campaign has been launched against Central Basin Director Leticia Vasquez. Leticia Vasquez is no stranger to recall campaigns in Southeast Los Angeles County. The embattled Director of the Central Basin Municipal Water District was booted out of office by voters in Lynwood on political corruption allegations ten years ago. The case was the focus of one of the biggest federal indictments in US history that landed then Lynwood Mayor Paul Richards in federal prison for a decade. She was recalled in 2007 after serving just one term in office in Lynwood. In addition to Richards, two other fellow councilmembers at that time went on to serve prison sentences for public corruption. Hews Media Group-Community Newspapers has learned that Vasquez is now the main target from a group of “concerned water customers” throughout the Central Basin territory. They want the Division 4 Director stripped of her elected duties for misusing her public office. This week, proponents announced a recall effort to oust Vasquez and HMG-CN has confirmed that organizers have begun the formal legal process of drafting the necessary documents to be filed with the Los Angeles County Registar-Recorder’s Office in Norwalk. The organizers, who do not want to be publicly identified at the time this article was written, said the gathering of the needed signatures could commence as soon as recall notices are published in a newspaper of general circulation. Central Basin has been at the center of growing controversy since Vasquez’ election. HMG-CN has published numerous articles since Jan 2013 highlighting Vasquez’ suspect dealings. HMG-CN was the first to reveal that Vasquez filed an August 2013 “Qui Tam” whistleblower lawsuit against several former contractors and employees of Central Basin, most of whom she aggressively sought campaign contributions from during her 2012 run for office. The revelation of the lawsuit showed that Vasquez was trying to cash in on a possible $2.5 million verdict by using her insider status at the District as a sitting-Director. See Qui Tam whistleblower story click here. Fellow Board Members Art Chacon and Phil Hawkins have labeled Vasquez an opportunist trying to get rich. In addition, numerous constituent complaints have been filed against Vasquez with the District Attorney and the Fair Political Practices Committee who as recently as January 21, 2014 opened an active investigation against Vasquez for attempting to conceal campaign donations. One substantial donation that went unreported was a $1,797.80 lavish campaign fundraiser hosted by Andy Camacho, brother of Pacifica Services, Inc. owner Ernie Camacho. Camacho and his firm, longtime contractors with Central Basin, sued the District months ago. Last week, HMG-CN revealed that Vasquez sent a representative to shakedown Camacho in exchange for her vote to settle the lawsuit in Pacifica’s favor. CBMWD lawyers have said their case against Pacifica is very strong, given more strength with the articles published this week by HMG-CN about Mike Sisson’s numerous Friday golf outings with former GM Art Aguilar and the thousands of racist and homophobic emails Sisson sent out from CBMWD while making $160 per hour. See golf story click here. Recall proponents also cited Vasquez’ questionable 2012 campaign contributors that helped propel her back into public office. HMG-CN was the first to report Vasquez’ campaign had largely been managed and financed by a convicted felon and former Central Basin Director Ricardo “Rick” Mayer of Whittier. 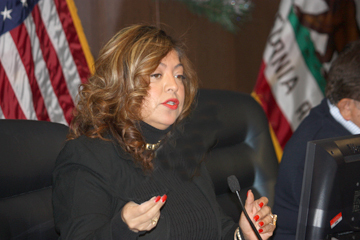 It was also revealed that notable campaign contributors to Vasquez’ campaign included recently indicted Senator Ronald Calderon of Montebello, Central Basin Director Robert “Bob” Apodaca (a staunch ally on the Board), attorney Ron Wilson, who is her long time life partner, past Central Basin vendors such as recently indicted former Assemblyman Tom Calderon, Pacifica Services Inc., Robert Garcia, Southwest Management Consultants, Golden State Advocacy, HDR Inc., Attorney Doug Wance, and C2 Group. Vasquez has also faced ongoing skepticism about her official place of residence. Her voter-identified residence is listed as 3817 Walnut Ave. in Lynwood while multiple sources claim that address is actually her brother’s home and that she resides in Baldwin Hills with her boyfriend Ron Wilson. The Baldwin Hills address is not in her Central Basin service District. HMG-CN has learned that the Los Angeles County District Attorney’s Office of Public Corruption is aware of the residential controversy swirling around Vasquez and Wilson. The recall proponent noted that residency issues existed when Vasquez was on the Lynwood Council and the fact she did not live in Lynwood was a huge factor in her overwhelming recall. “Leticia Vasquez has always felt she was too good for the people she was elected to represent, she was more than willing to exploit them to get herself elected, but not to live among them,” he added. Recall organizers have 160 days to collect the 10,420 signatures required to force an election to recall Vasquez. “That may seem like a lot, but we have a motivated and well-funded team in place that are sick and tired of “bottom of the barrel” predator politicians like Leticia Vasquez,” the proponent said. He was told that Vasquez was talking about running for higher office the second she was sworn-in at Central Basin already plotting bigger paydays for herself. “This will hopefully be Leticia’s last recall and the last time area voters will have to deal with this self-serving so-called public servant, we are done with her,” he concluded. Below is an interview of Central Basin Water Director Vasquez by HMG-CN Investigative Reporter Randy Economy after the March 4, 2014 CB Special Meeting. I live a few doors down from Leticia’s brothers house in Lynwood. I cannot believe the authorities haven’t proven Leticia doesn’t live here. I honestly don’t see her even visit her brother more than 3-4 times a year. Isn’t that a hoot? I support this effort unfortunately. It needs to be accomplished.